Text & Images By Glen (BAHDog) © All rights reserved. I chose the page in the larger book that has a photo and I had enough room to add another note to the Ice Crystals after I shot this. I learned that those Ice Crystals only form as Needles like that at -5 degrees C. You can see the difference between the large and small book. Every page is different. I even paste other things in at times. I added a sepia postcard I made as well. This is a good way to contact friends and might be a very good way to keep clients in the loop of your new work or other plans. It is quite exciting to receive a real handmade, personalized postcard in these days of commercialization. You can even add text if you want. I just use regular glossy 4x6 photo paper and use a ultra-fine Sharpie on the back to make the address/message format and stick one of those attractive Common Buckeye postcard stamps to it. 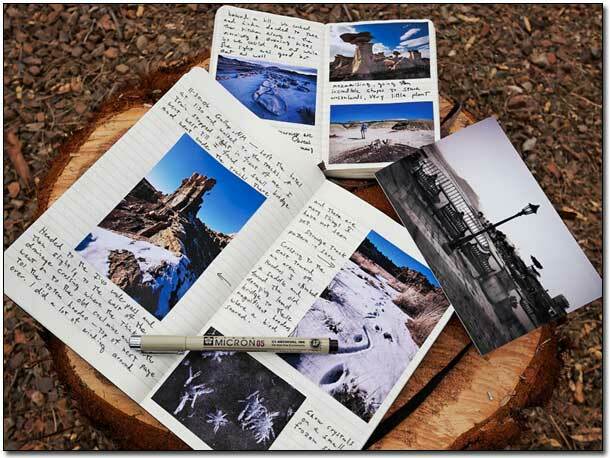 It is fine and safe burning everything to DVD but this is a more appealing way to keep things in a chronological order, put hiking, photographic and post processing notes where they are useful.